This photo was taken by my younger daughter whose hobby is taking photos of the natural setting of her country home. 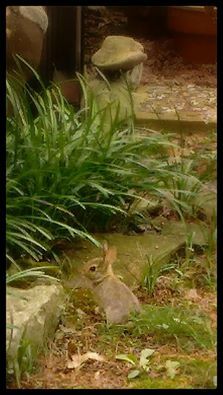 This little bunny had been hiding himself in various places around her porch. At last he ventured out and her patience rewarded, she caught his image. Every time I look at this photo, I am reminded of all the little animals with which we are blessed: beautiful, innocent, and always in peril. There’s a quiet lesson here.